The history of racial laws told through photos, drawings and videos. 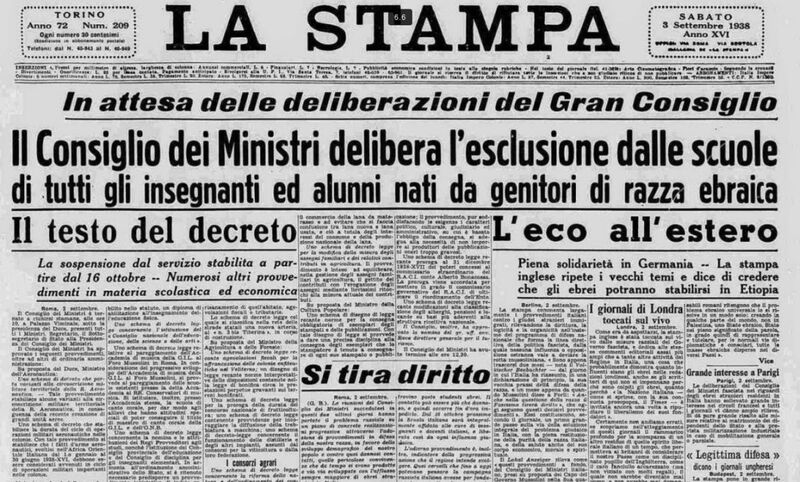 The multimedia exhibition, “Eighty years since the Fascist racial laws (1938-2018)”, gathers together important historical documents of Italian schools in the 20 years of fascism, a period of time when school was one of the main sectors on which the fascist regime focused in order to create the “new fascist man”. The virtual exhibition is curated by Indire’s researcher Pamela Giorgi and Elena Mazzini, researcher in contemporary history. Irene Zoppi (Indire) supervised and processed the pictures. This work was produced thanks to a vast historical documentation, preserved for a long time in Indire’s historical archive. These are resources testifying the history of Fascism from the perspective of the teachers and the students who took part in the regime’s propaganda, creating the school fascist unit. The exhibition is organised into 6 sessions including archive materials divided by subject and time period and is addressed to teachers and students as a tool for integration and didactic aid to learn about one of the darkest times of our history. The documents that have been used are notebooks, drawings, photos and books kept in the Indire’s archive and dating back to the National Didactic Exhibition of 1925.